My Facebook page reached 1,000+ likes this week! As a “thank you” gift to all of my loyal readers, I have packaged five of my favorite Studio Windlight settings for you to download. I haven’t ever shared these Windlight Settings before, even though tons of people have asked! Please enjoy them, and let me know if you like them! A lot of people don’t know this, but the direction that your avatar faces matters when using a Windlight Setting made by someone else. When I am on a pose stand, my avatar is always facing SOUTH, and the blank prim background is behind me. All of these settings were created with Ultra graphics settings, but they’ll work for lower graphics settings too. If your picture doesn’t look exactly like mine, it’s probably due to having a different graphics card & graphics settings. 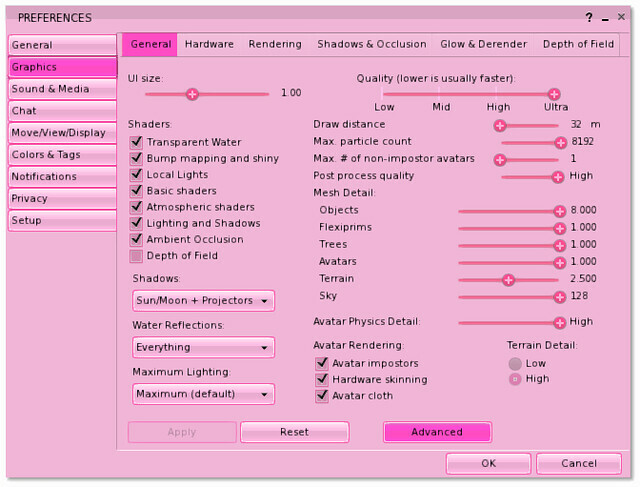 Download the JUICYBOMB.COM – Studio Windlight Settings! Feel free to modify the Windlight Settings for your own personal use. Thank you, Gogo and congrats about facebook! Thanks so much for sharing, Gogo. Well done on the 1k likes and keep up your amazing blog, I love it so much. Your avi is always so beautiful. Many congrats on your Facebook page! Thank you so much for posting these, can’t wait to check them out inworld. Congrats and thank you, Gogo! Wow…thanks so much for sharing this!! Congratulations on the FB likes! Thank you for the Windlight Settings! This is a blessing and a curse for me because I’m somewhat of a Windlight Setting addict and it often takes me forever to take a picture because I spend so much time going through WLS to find the perfect one. Now I have 5 more to add to the list! Awesome! Thanks Gogo for sharing. Thanks Ziki! i was like “what did i do wrong” and then i read your comment! Thank you so much and congrats on the likes! Pingback: Taking a TRAM ride « Dawnde's wearing what?! Awesome! Thanks Gogo for sharing, and congrats for ll the likes! first i congratulate on your likes, that is so fantastic! i downloaded the settings but as it seems i can not find an appdata folder on my computer at all… i somewhere read that you can hide folders but how to un-hide them again i do not kow, so maybe that would be my problem i guess… i hope i get them up and running because i like the effects very every much, thank you for sharing them with us! i got it done and love it!!!!!! they are so so so great! thank you for your generous gesture!! !… me is in love with those new settings to play with! I took your windlight settings for a test drive, and I love them!! I posted about 8 new pics on my Flicker page entitled “If I was green” (btw, ty for adding me as a contact there! ), and I also posted a link to them on my new Facebook page…the link to that is above. Thanks again!! Thank you for taking the time to share these ! Thanks you gogo for these awsome windlight settings, SL seems so more vibrant nowadays! Love the hair where is it from? Thank you for these great settings! So whenever you’re taking a photo, it’s the farther you are from the background = more shadows? drop shadows, etc. Pingback: Raising blue (Post-95587) - [O.L.D.] Old London Docks - Best Second Life Fashion & Lifestyle Blog Feeds! Pingback: I need you darling, come on set the tone – Ed Sheerhan | madi Likes It - O Yea!